Last Friday I got to show you a color-themed quiet book from Poland, and today I get to show you one from England! 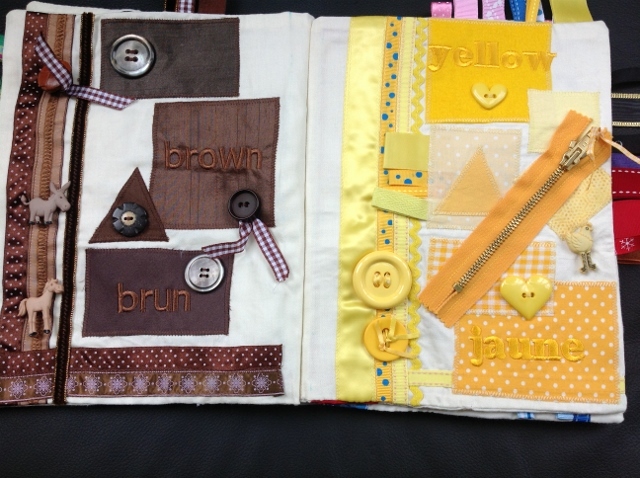 Made by Moira, a retired textiles teacher, this colors book has lots of fun ribbons, buttons, and zippers for young children to grab and play with. 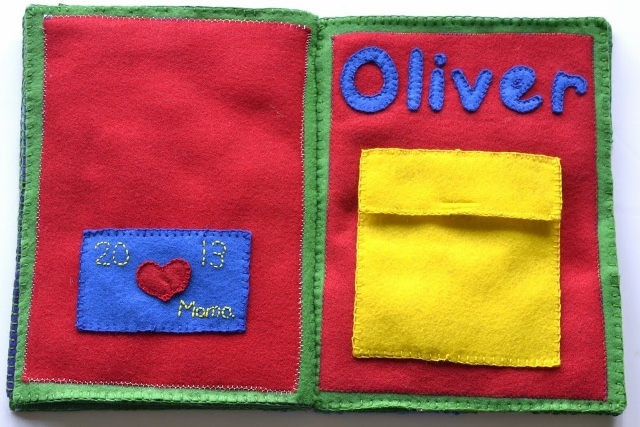 In addition, the name of each color is embroidered in both French and English. 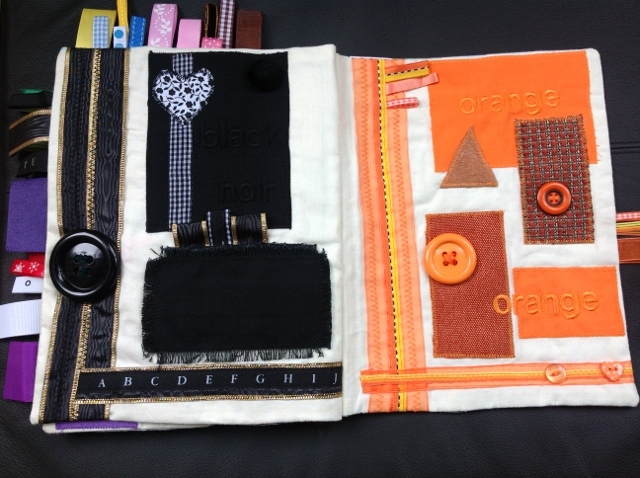 I really like all the different shades of each color Moira used and all the different patterns, and think that this would be a great book for teaching colors! My name is Moira. I am a recently retired textiles teacher in East Yorkshire, England. 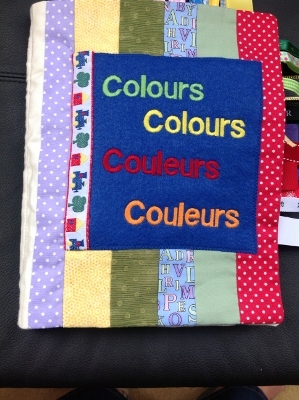 I have made my quiet book for my Grandson Daniel who lives in Quebec, Canada. This is why the words are in French and English. 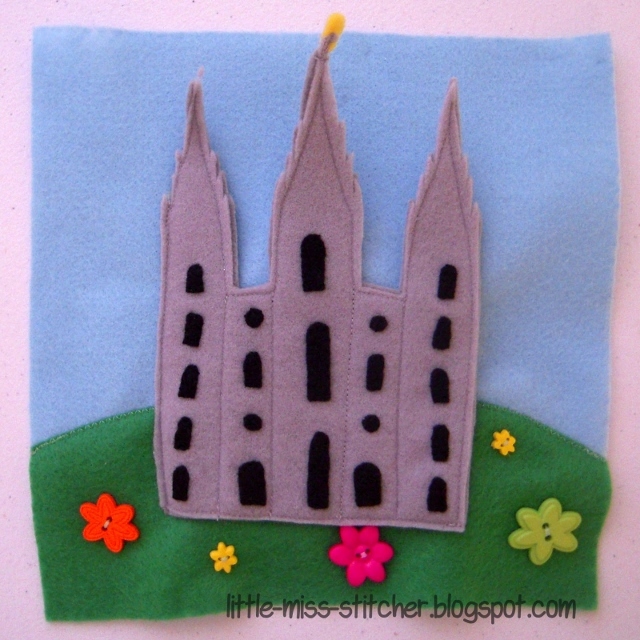 I am a very confident and creative person preferring to work in fabric most of the time. 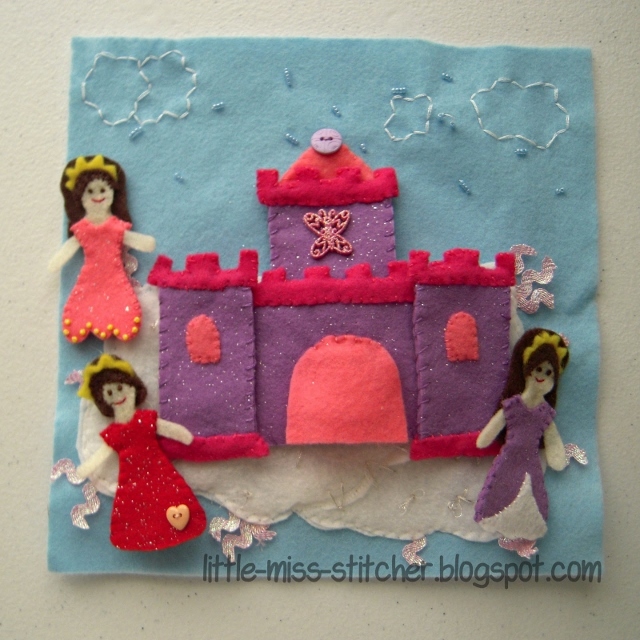 I have been stitching for perhaps 30 years. My quiet book took many hours of work, both the designing and making of the book. I estimate possibly 15 hours of making including putting the pages together. 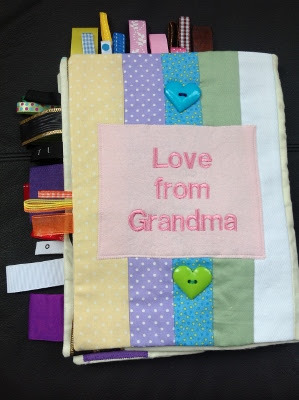 The pages are sewn together down the centre fold using machine stitching. 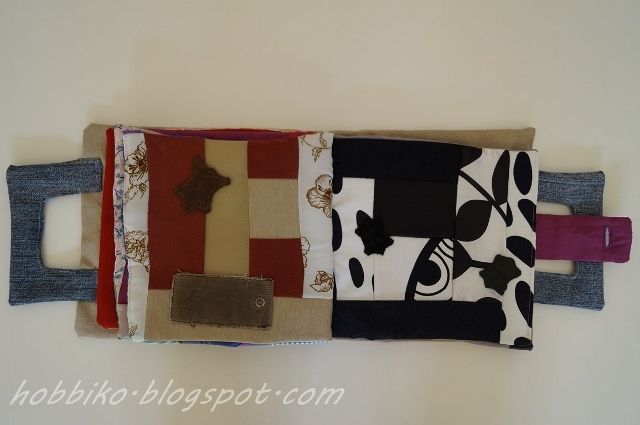 The pages are made mostly of cotto fabrics with polyester ribbons and some synthetic felt. 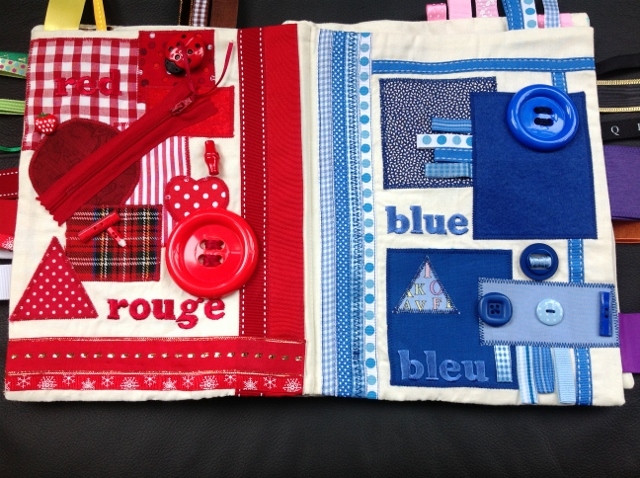 My favourite page is the red and blue one as it is also Daniel's favourite. I took his book out to Canada last month and loved watching him play with all the different features. He is too young at 12 months to be able to learn his colours etc but he is obviously enjoying "playing" with the book even at this young age. I have already partly finished a number book for him. 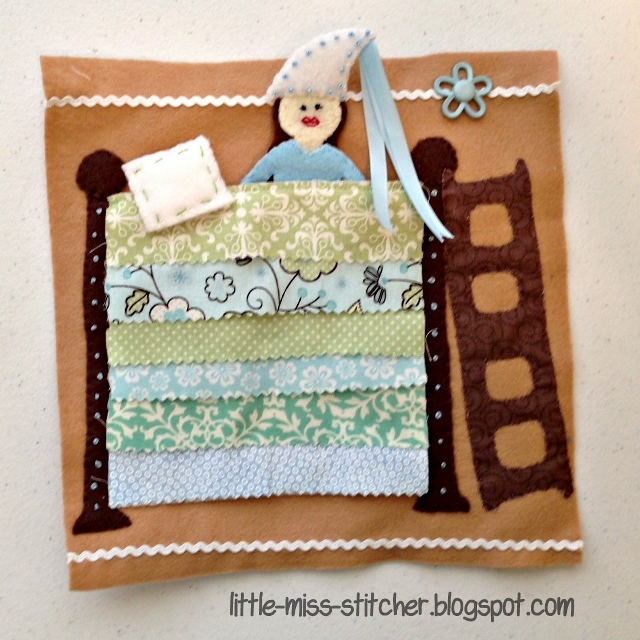 Thank you so much, Moira, for sharing your delightful colors quiet book with us! To visit Joanna's blog, visit Hobbiko.blogspot.com. Thank you for sharing your quiet book with us, Joanna! Hi everyone! 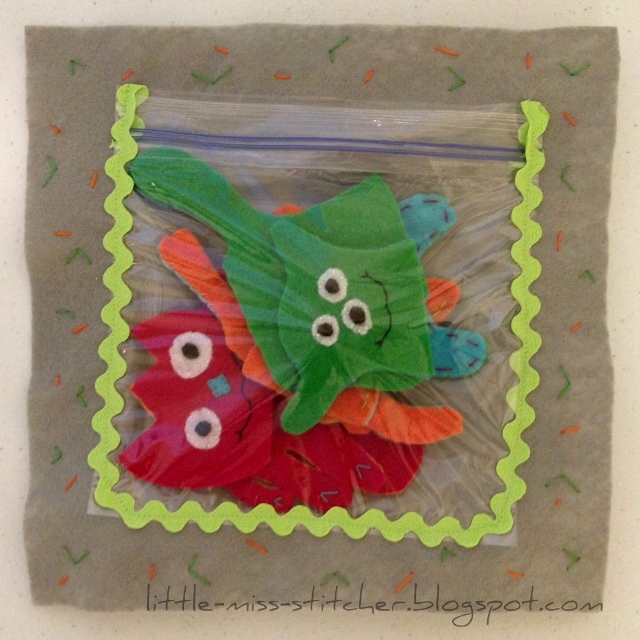 You've now seen Kersten's Dinosaur Quiet Book and her Build-a-Monster quiet book page; I am happy to now present to you her "Little Sister Quiet Book!" 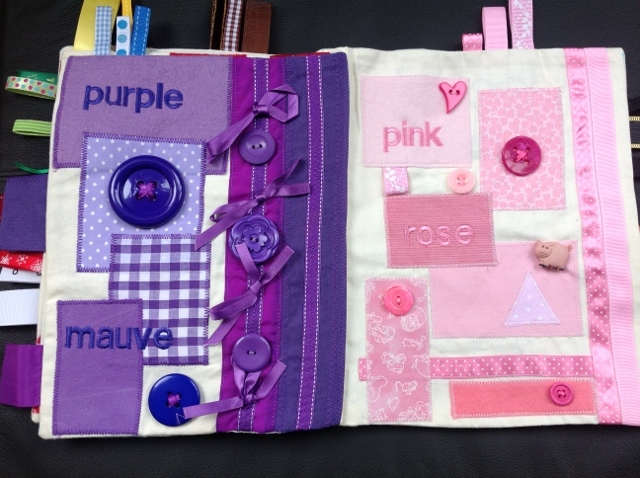 She made this for her younger sister, and it has so many cute and fun-looking pages. 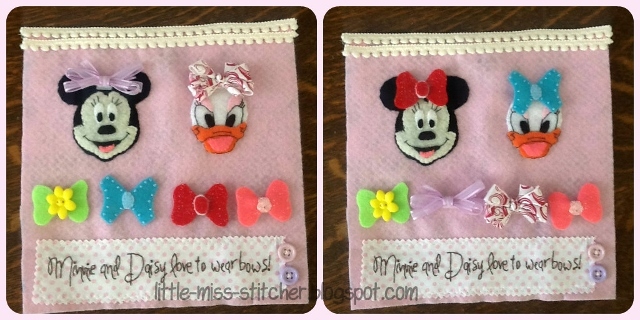 She has a dress-up bow page where you can change the hair bows Minnie Mouse and Daisy Duck are wearing; she has a cake and cupcake page with removable details using snaps, buttons, and velcro; she has a temple page, an underwater page, a build-a-castle page, and even a Princess and the Pea page! Everything is so bright and cute. Enjoy! I made it for my little sister, who just turned two. It took me about a thousand hours over the course of a couple of months. I did a page here and there until I decided I had more than enough pages! 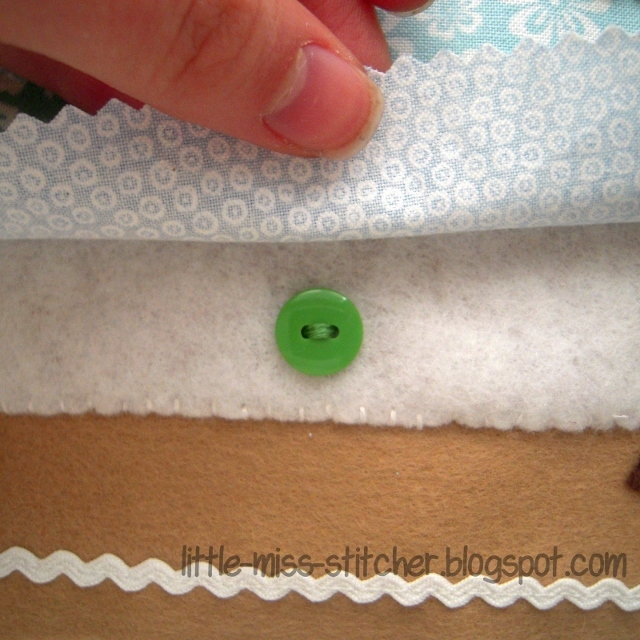 I put two button holes on the side of each page and then use binder rings to hold it all together. Ric rac, ribbon, buttons, fabric, DMC floss, beads, sequins...and probably a few other things! Between scraps and raiding my Mom's supplies it can't have cost more than ten or so bucks. That's such a hard question. Probably either the Build a Cake or Cupcakes page! 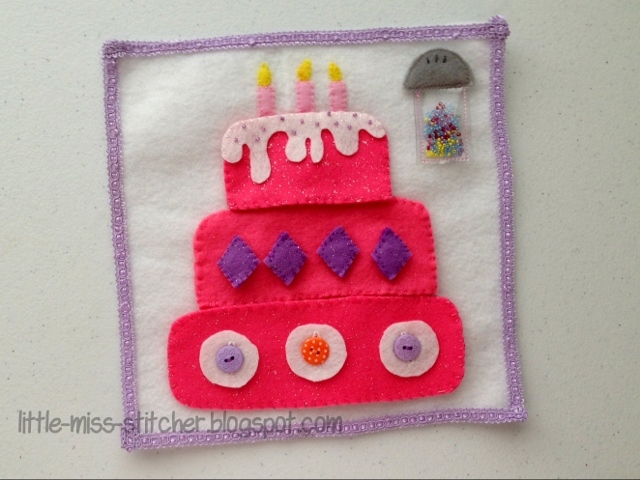 To see more pictures of Kersten's quiet book, to learn more details about how she made it, and to use her templates, visit her blog posts on her "Little Sister Quiet Book" at Little Miss Stitcher. Good morning everyone, and happy Monday! I hope it's a bright, clear fall morning for you. (I am so excited that it's now officially fall. Fall is my favorite season!) 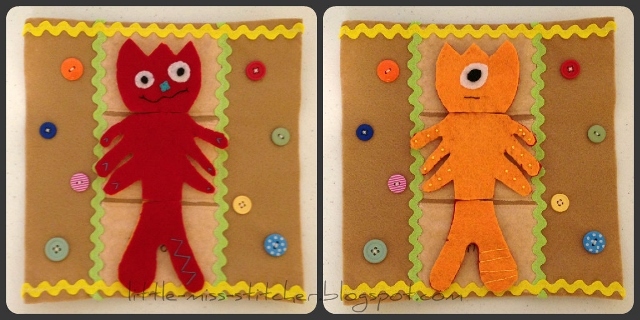 I have a really awesome quiet book page to share with you today. 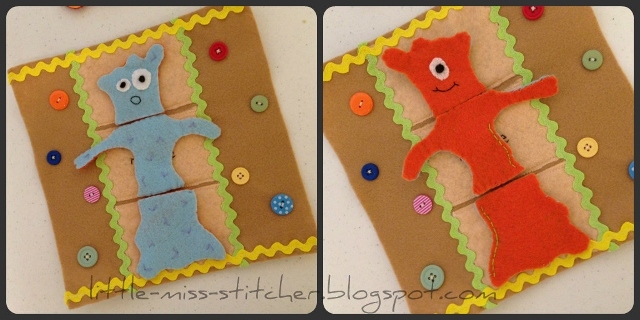 It was made by Kersten of Little Miss Stitcher, the very same Kersten who made this awesome Dinosaur Quiet Book that I shared with you a while back. I made it for a the kids of a lady my sister babysits for. I'm not exactly sure how old they are! I think it was only like two naptimes. These pages are a part of a bigger book than I bound by putting two button holes in the side of each page and then using binder rings to hold all the pages together. 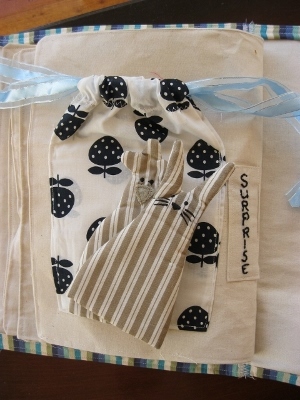 A zip lock baggie, small beads, buttons and ric rac. Nothing. I just used things I already had. 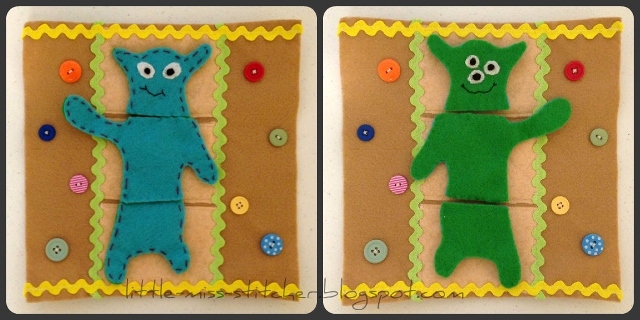 To see Kersten's Build a Monster page on her own blog, with more details and links to her templates, click here: Build a Monster Quiet Book Page! 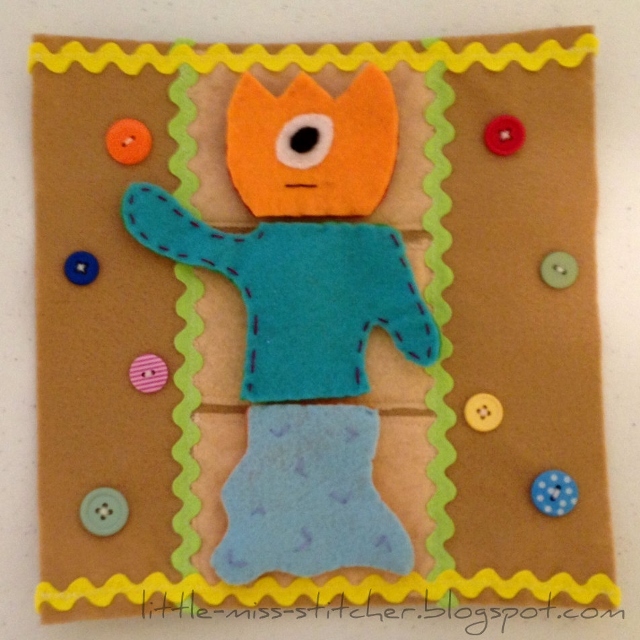 Thank you so much for sharing your monster page with us, Kersten! Hey everyone! I love the quiet book I get to share with you today. 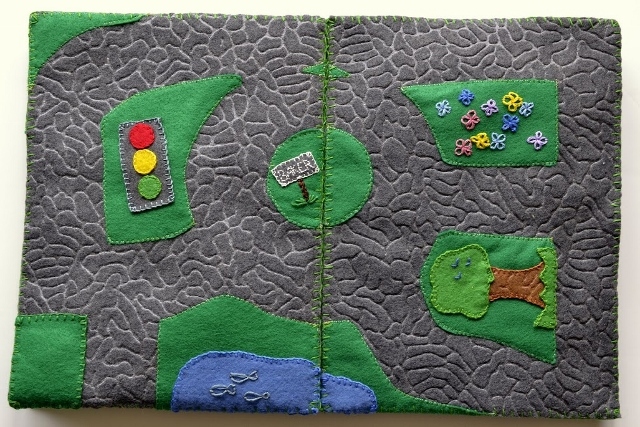 It was made by Carrie of November Morning for her four-year-old son, and it has so much texture and detail that everything just pops off the page. 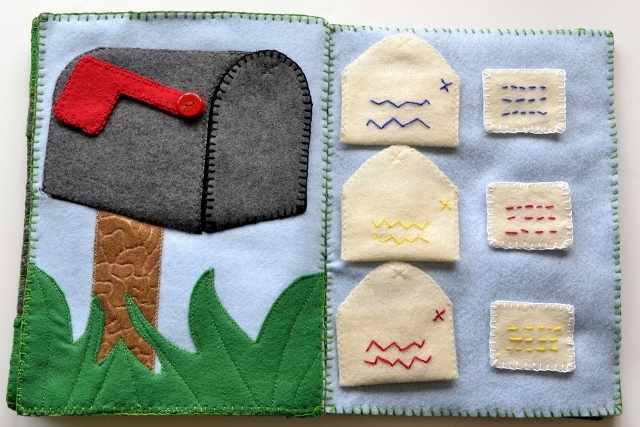 The hand-stitching is so cute and I love that she uses textured felt - it's such a great way to add visual detail to a quiet book without more work. 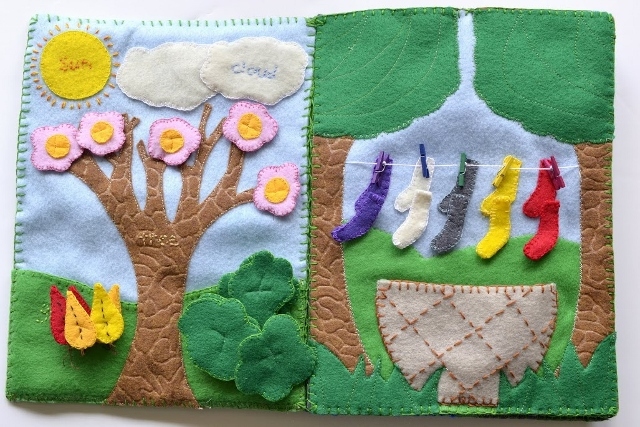 I would be very hard-pressed to choose a favorite page in this book, but if I had to choose one here I'd pick the seasons/tree page with changeable foliage and the laundry-line page next to it. Both pages are so cute and work so well together. Anyway, scroll down, look, and enjoy! Carrie. 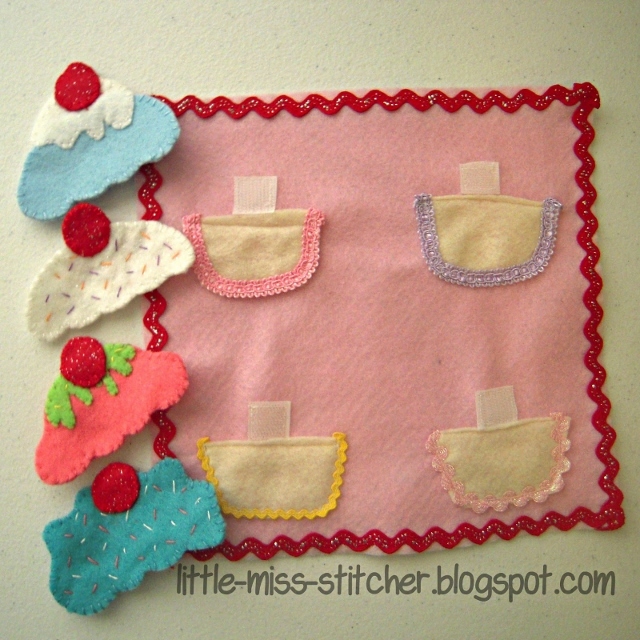 I'm a crafting, knitting, photographing, sewing, and baking mama and wife. I made this for my son a couple of months before he turned four. I'm not an expert sewist by any means. I'm not sure how long it took total but I'm sure it was many many hours. I did a lot of hand-sewing and spread the work out over a couple of months. I mostly cut and drew free-hand. There is also a ton of inspiration on Pinterest. 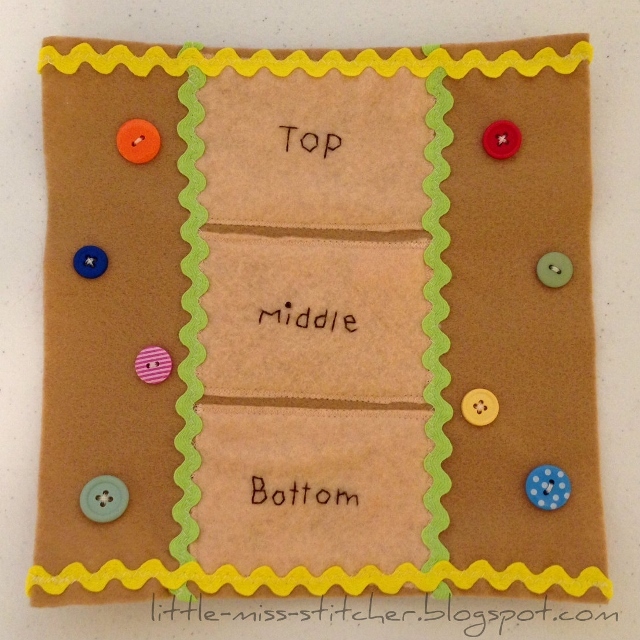 I bound it using embroidery thread and this tutorial. 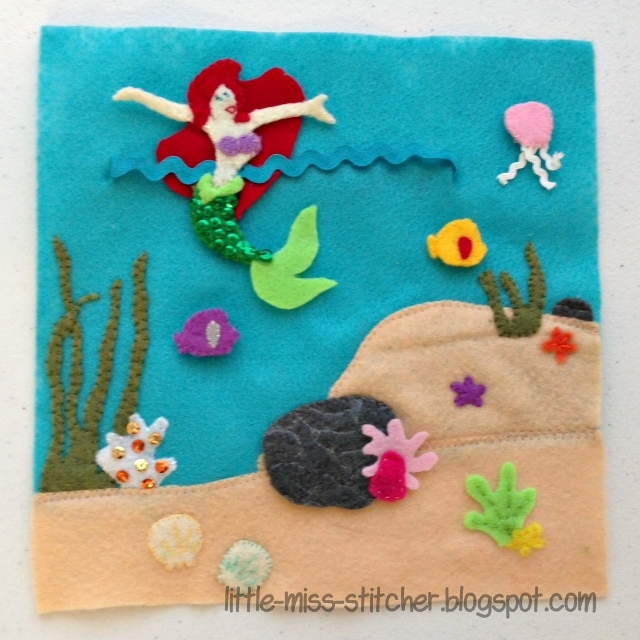 Felt, felt, and more felt! 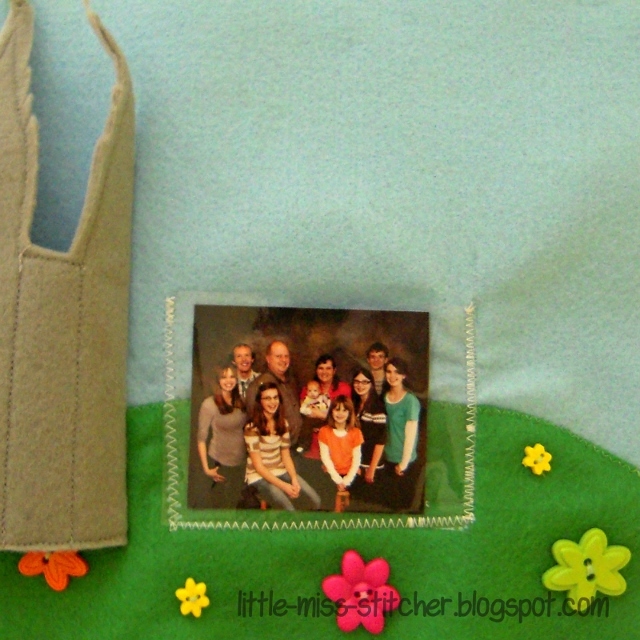 Embroidery thread and snagless velcro. 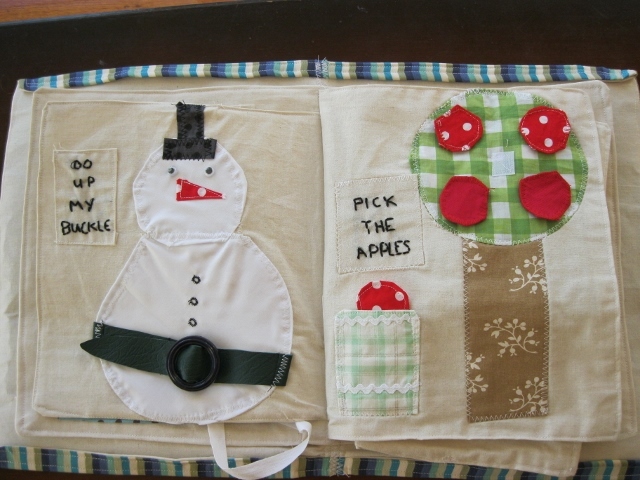 It's too hard for me to pick favorite, but I am a tiny bit partial to the seasons pages. O's current favorite is the mailbox pages. Most of the adults that see it seem to like the robot page best. 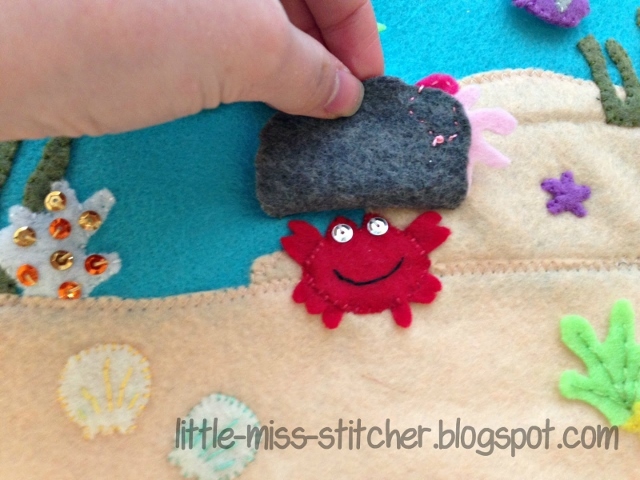 A big post on the book (with more photos and lots of tips) can be found on Carrie's blog here: November Morning: O's Felt Book. Thank you so much for sharing your amazing quiet book with us, Carrie! Good morning everyone! The very cute quiet book I have to share with you today is all the way from Australia. 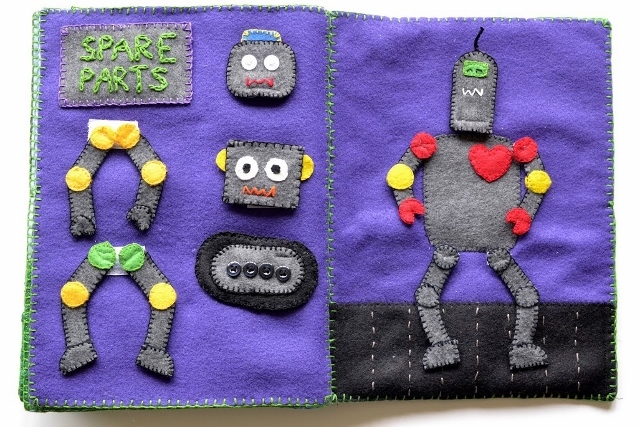 Made by mom Nadia for her son, it has lots of fun activities to keep him entertained. I think my very favorite pages are the shapes page and the bead-counting page. They're both so colorful, and I know my daughter would love them. 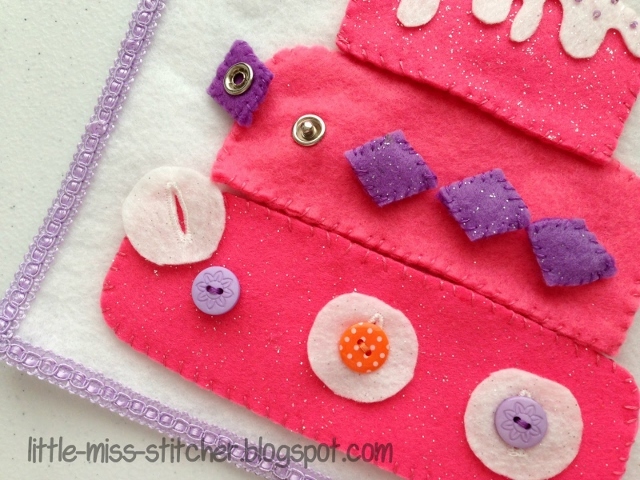 I love that the shapes are made out of such cute fabric - I just love the bright patterns. Anyway, I'll stop rambling so that you can take a look! My name is Nadia. I am a mum of one from Melbourne, Australia, currently taking a break from social work. 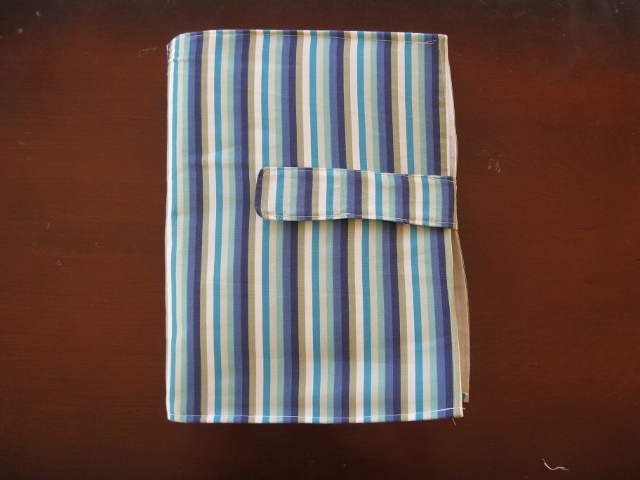 I made this quiet book for my son, Caleb who is 10 months old. It will be a Christmas present. I have been wanting to prepare for when he is a toddler and on the go with some activities that will keep him occupied during church. 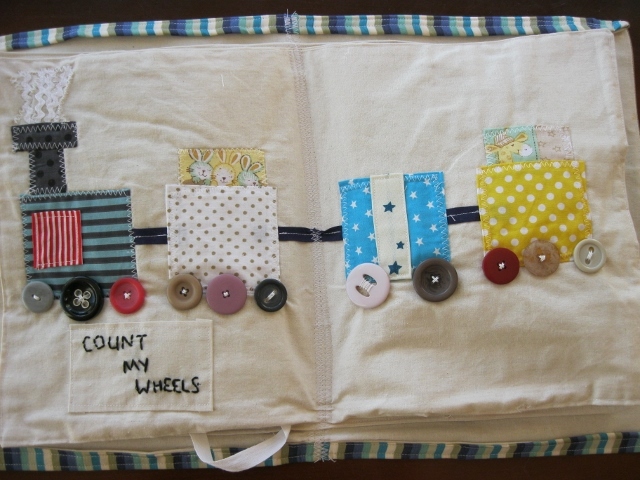 I know that when he is on the go, I wont have as much time to create things like quiet books. I am probably a beginner, self taught. 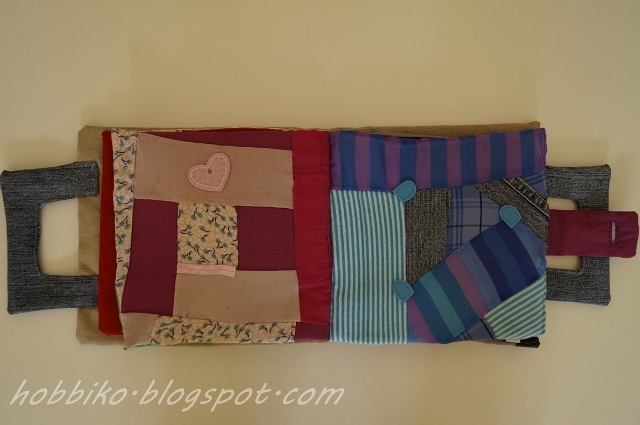 I have made a few simple baby quilts in the past, but nothing like a quiet book. 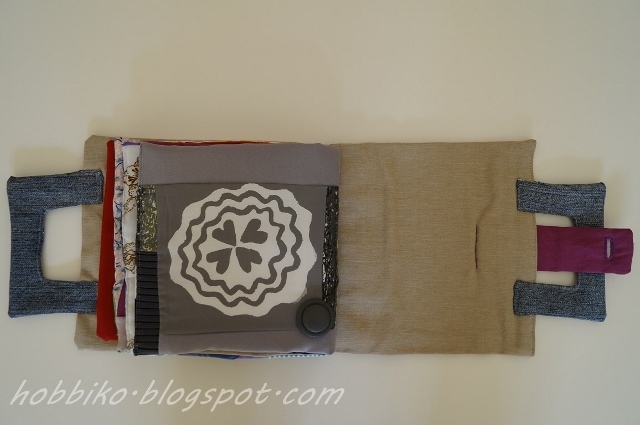 I feel I have definitely increased my knowledge of sewing through taking on this task, learning lots on the way from others and through lots of mistakes. Its hard to answer that. I have probably spent the last 4-5 months on the book working in big spurts, then having big breaks. It probably took 15-20 hours all together. 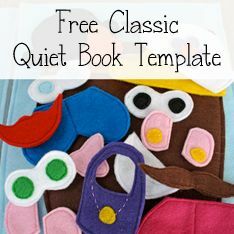 I used no templates, rather got inspiration of friends quiet books, from the quiet book blog, pinterest and other websites. When I had decided what pages I wanted, I used various household objects to make the shapes, such as bowls, measuring cups, and a rubix cube. 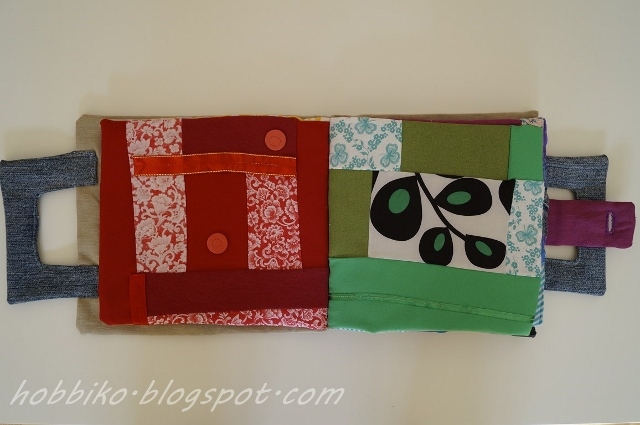 I bound my book by sewing double pages down the center onto a cover. 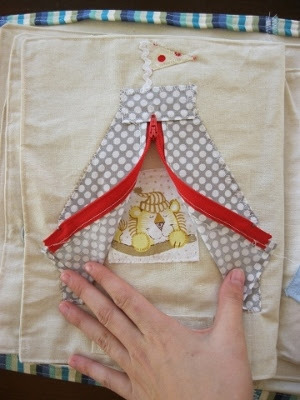 The pages are made out of calico, some lined with interfacing. 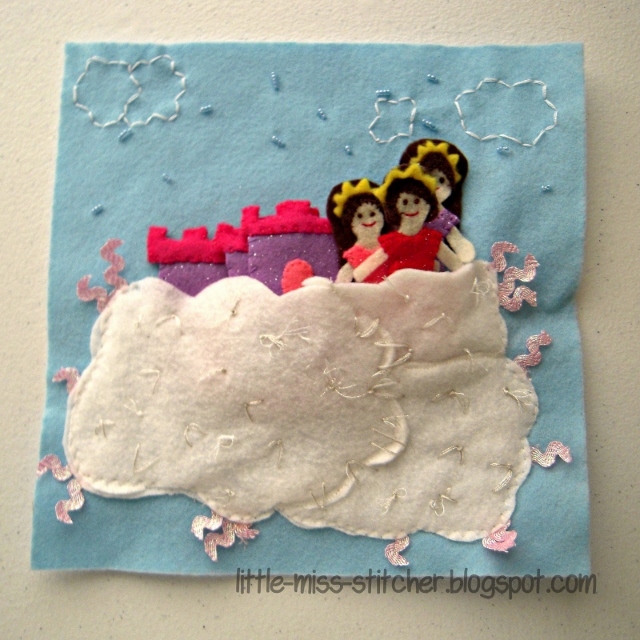 I used cotton from my scrap box to make the pictures. 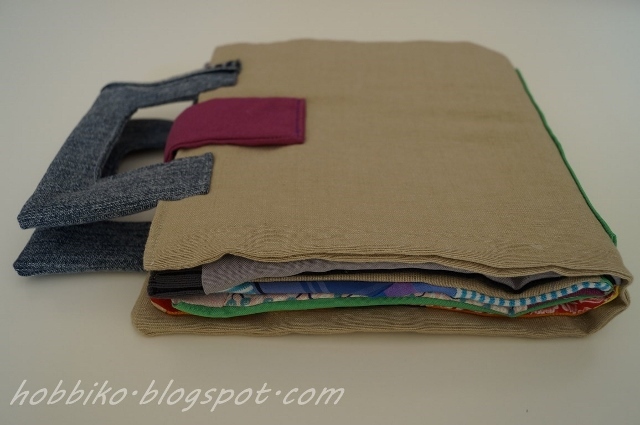 It took quiet a bit of work as I bagged out shapes to stop the fraying. 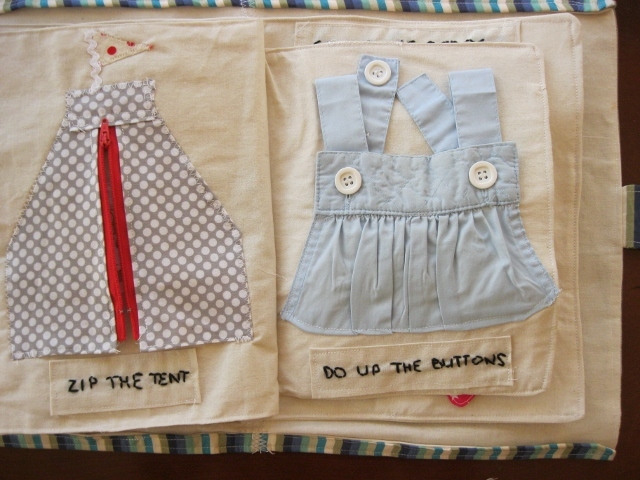 I also used valcro, a zip, buckle, a cut up baby overall, a toothbrush, leather, shoe lace, buttons, and beads. This is hard to answer as I collected supplies over a long time. Most of my fabric was from my scrap box and most of the other supplies were sourced from op shops or relatives with button collections. I probably spent $25 AUS or so on calico, fabric for the front cover, beads and my op shop bargains. 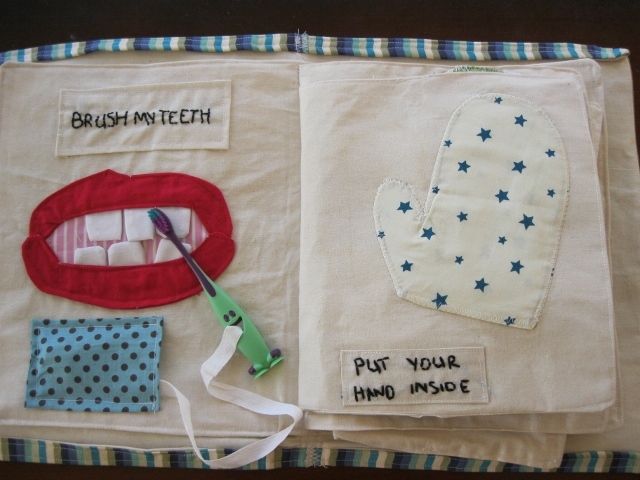 I like my brush my teeth page. The mouth turned out better then I was expecting and I think a young child would have fun brushing teeth! I also liked how the tent and my shoe turned out. 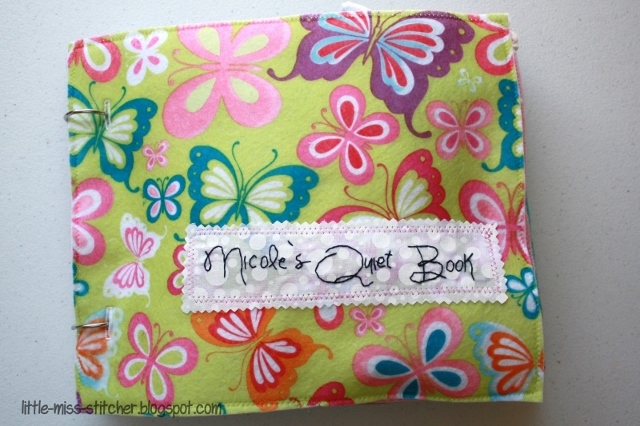 Thank you for sharing your super cute quiet book with us, Nadia! Hey everyone, I hope you had a great weekend! I have a really bright and cheerful quiet book to share with you this morning. It was made by Myranda of Myranda's Sweet Treats, and I absolutely love the green and white chevron-striped fabric that makes up the background of each page. It's so happy! 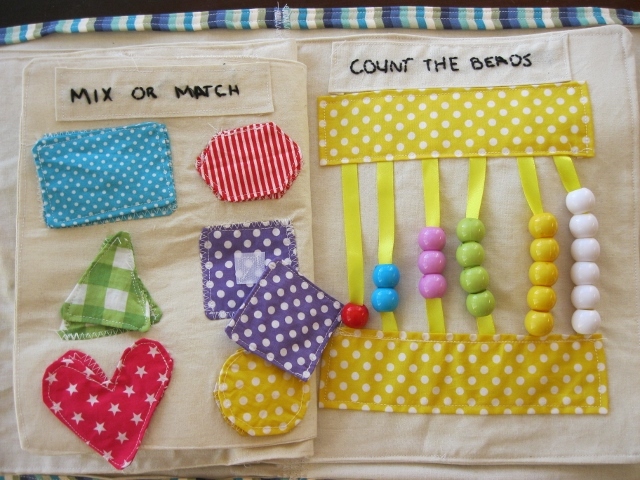 All of the pages look really fun to play with, too; I know my daughter would love to play with all of these activities. 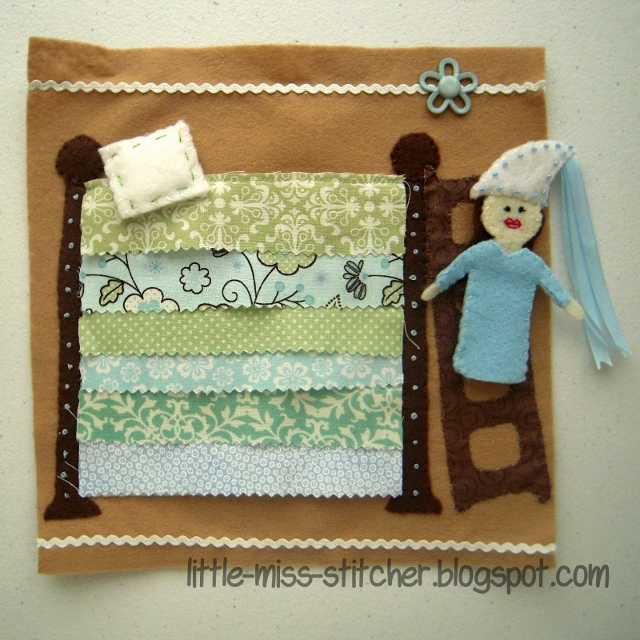 (And isn't her weaving page cute? It's a heart!) Anyway, I'll stop rambling and let you take a look. Enjoy! Myranda. I am a Stay at Home mom who crafts often and is currently in the local business of cake decorating. My son Liam; he is almost 1.5 years old. Intermediate. I have been sewing for many years, have made a few (simple quilts) and other projects, but I don’t feel ready to take on a more professional quilt. About 15 hours. 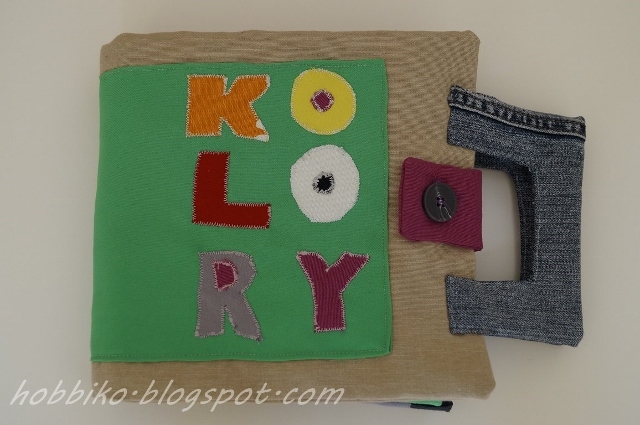 I used lots of fabric and little felt as it was what I had on hand, meaning most pages had to be sewn wrong sides together and turned inside out to reduce any possibly fraying in the future, where felt doesn’t fray you can make a book with a lot less steps. I also stopped to take pictures for an upcoming tutorial. 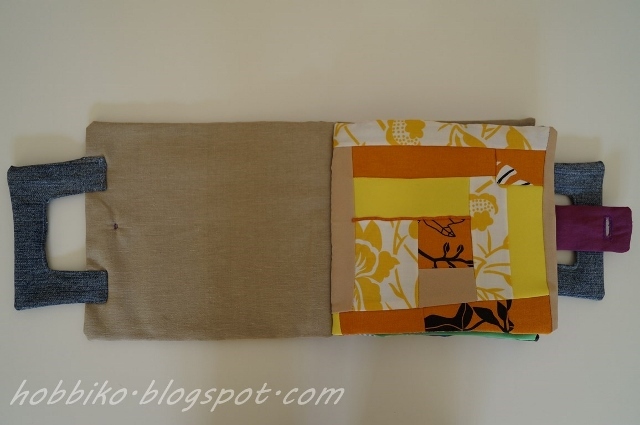 I spread it out over 3 days of continuous sewing during nap times and long, late evening. Yes, I used a few at homemadebyjill.blogspot.com and popsandpodge.com. I also drew a bit of my own and used Microsoft Word for letters and Paint for for any shapes. 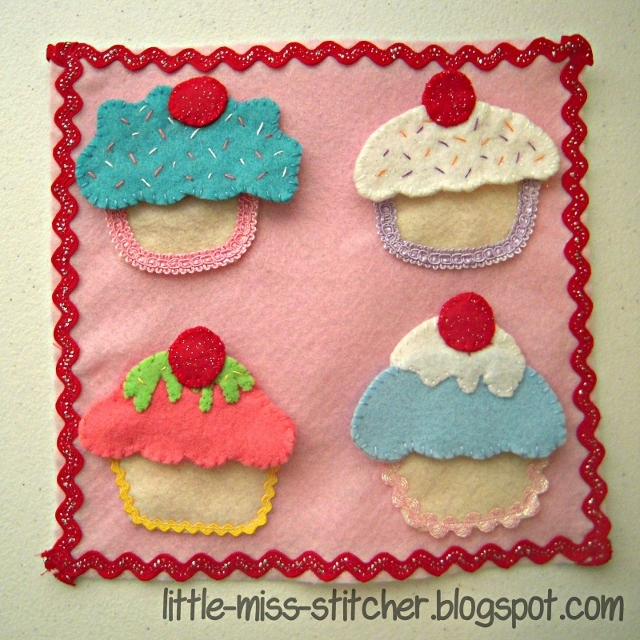 I will be including some at my blog as soon as the posts are done at http://myrandas-sweet-treats.blogspot.ca/. With large eyelets and key rings. Fabric- a canvas cotton- it’s heavier and a bit more forgiving to years of use, and a few are from regular cotton I had on hand. 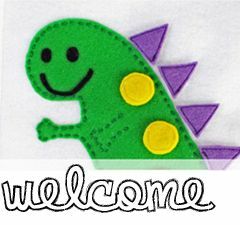 Cottons, fleece, chenille fabric, felt, buttons, zippers, belt buckles, paracord buckles, ribbon, bias tapes, beads, velcro, snaps, elastic, fabric markers, heat n bond, interfacing, batting. The Puppy Dog and Flying Space Ship Page, I love the overall look and they are my son’s favorite! 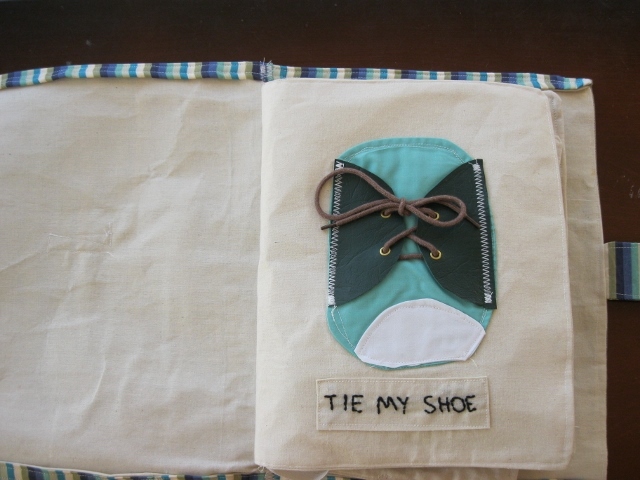 Myranda also makes these quiet books to order. If you'd like to purchase one, visit the Facebook page Boy, oh Boy: Boy, oh Boy and check out the post on July 9th (or you can just click here: Boy, oh Boy: Quiet & Busy Books). 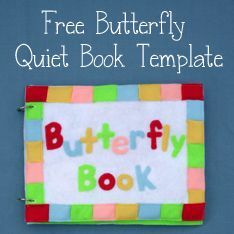 Here are the instructions on how to order a quiet book: How to Order and Store Policies. Thank you so much for sharing your quiet book with us, Myranda. It's awesome!